Mayor Rob Ford’s budget is out and public hearings are set up for next week. The proposed budget drains City funds and assets this year to enable Ford to freeze taxes this year. 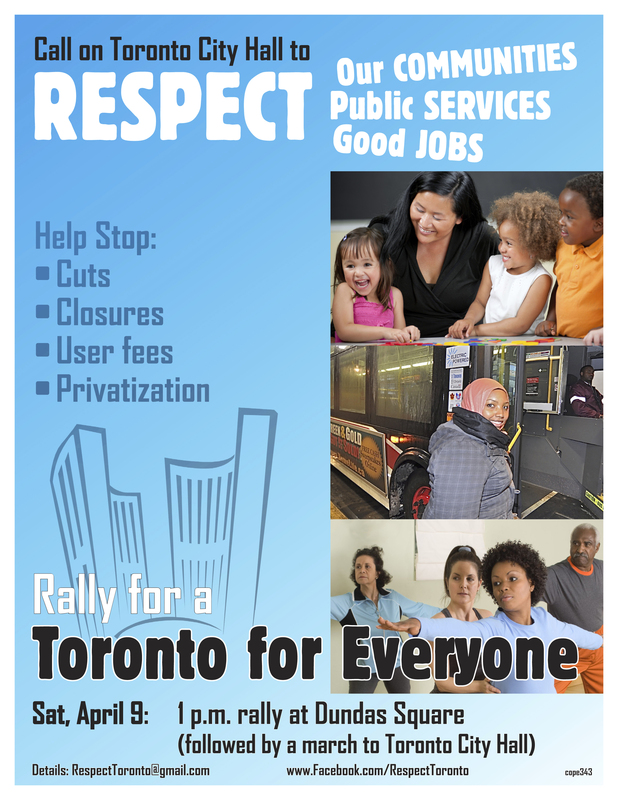 There are cuts to programs to vulnerable groups, such as tenants, TTC riders and recreation users in poor communities. Click here to read what the Toronto Star wrote about the cuts in the current budget. Check to see if you are affected by these cuts, and register to make a deputation! To register to make a deputation notify the City Clerk, Budget Committee, by calling 416-392-1032 or 416-397-7768 or e-mailing buc@toronto.ca no later than 12 p.m. on January 18, 2011, indicating your preferred date and location. There will be a 5 minute time limit for each presentation. This budget is about battling visions – Ford’s Toronto is one where services are cut or contracted out. Our vision is about investing in our City and our communities especially at a time when unemployment and poverty pervade our city. We would like you to come to the budget hearings as a resident and share our vision for Toronto. Whether you decide to speak or not, please come out. IMPORTANT NOTE: The consultation at City Hall is sponsored by councillors not by Mayor Ford, so if you want to make sure that Mayor Ford hears you, come to the hearings listed below. 850 Coxwell Ave 5100 Yonge St.
150 Borough Dr. 2700 Eglinton Ave. W.
The proposed 2011 City Budget was released at City Hall this week. This year, the City will consider its Capital, Operating, Water and Solid Waste budgets together and in a shorter period of time. The budget will determine how much funding is available to deliver the City programs, services, and facilities that residents rely on every day. I want you to understand how the budget will affect these services, and I want to hear your views. Over the next three weeks, the Budget Committee and Council will debate, make changes and approve the budget. Your input can make a difference. Below you will find more information about the 2011 budget proposals and the next article in this newsletter details how to get involved. For more information about the budget, you can view the City web page at www.toronto.ca/budget2011. The 2011 proposed budget has been balanced by drawing on our savings (reserves), reducing services and using the one-time surplus of $350 Million from 2009 and 2010. With a tax increase of 0% and the elimination of $64 million in revenue from the Personal Vehicle Tax, the City has fewer ongoing revenues to build a sustainable budget for the future. The following is a summary of some of most important features of the proposed 2011 Budget. • The proposed property tax rate increase from last year is 0%, so your property tax bill should stay the same. • The proposed Garbage Bin Fee increase is 3%, which will cost the average household $6-$12 per year, depending on the size of bin used. • Adults taking programs at designated Priority Recreation Centres, such as the Secord Recreation Centre, will now have to pay fees for programs. • The Urban Affairs Library at Metro Hall will be closed, and the collections and staff moved to the Toronto Reference Library. • The TTC has proposed reducing the service on 48 routes, including the 62 Mortimer Bus after 10pm on weekends and holidays. • January 19: Budget Committee Hearings at the East York Civic Centre (see www.janetdavis.ca for more information) and the North York Civic Centre. Human Rights award for her dedication and commitment to creating an inclusive and fair Toronto. The Ontario Public Services Employees Union has taken the strategic step of campaigning to stop the latest phase-in of the provincial corporate tax cuts. This week, Energy Minister Brad Duguid, said consumer energy bills will rise by 3.5% a year, as part of the government’s 20 year energy plan. Only part of this increase is due to the McGuinty government’s commendable commitment to up the amount of electricity generated from green sources, like wind and solar, from 3 to 15% by 2030. If Ikea can do it why can’t we? Last month, Ikea announced that it is installing solar panels on three of its retail outlets in North Etobicoke, Vaughan, and North York.